Helloooooo, November! I'm so happy it's practically the holidays! I'm also super glad that I've made it through Halloween without going into diabetic shock. Gosh, I inhaled so much candy the last couple days. Does anyone remember 100 Grand Bars? They are so good. I've basically been hunting for them in the candy bowl at work the past two days. I'll probably try to sneak in one last 100 Grand tomorrow. I need to stop though. I need to eat vegetables and not have candy until 2018. Let's all make dentist appointments. Did you dress up for Halloween? Did people understand your costume? I'm sure they did! I dressed up as my Grandma Young (my mom's maiden name, not to be confused with a young grandma). I've never felt more like myself. Other than the wig. My head is way too big to fit comfortably in the average wigI was so cozy in my loose pants and turtleneck/sweater vest combo. It was awesome. Then when everyone else went out to a bar after work, I felt no guilt in saying that I was tired and wanted to go home. Grandma needs to sleep! And finish Stranger Things TBH. Even though I'm still a spry 26 year old, I fully embrace my Grandma-ness. Like, life is really tiring. Working a full time job, blogging on the side, and then filling in all the extra waking minutes with painting and random side projects is exhausting. I want to sleep and wear soft pants as much as I can. I want to leisurely sip matcha lattes in the morning and eat oatmeal. Everyday. Is it sad that mornings full of tea and oatmeal make my heart swell (in a good way)? No, of course not. Grandma needs a vacation though. I've been doubling up on recipe testing during the weekends because in a few weeks we are essentially going on a bunch of mini vacations until Christmas. Tahoe! Thanksgiving! Healdsburg! Holiday Parties! Cleveland! Then it's 2018! I just know it's going to go by in the blink of an eye. 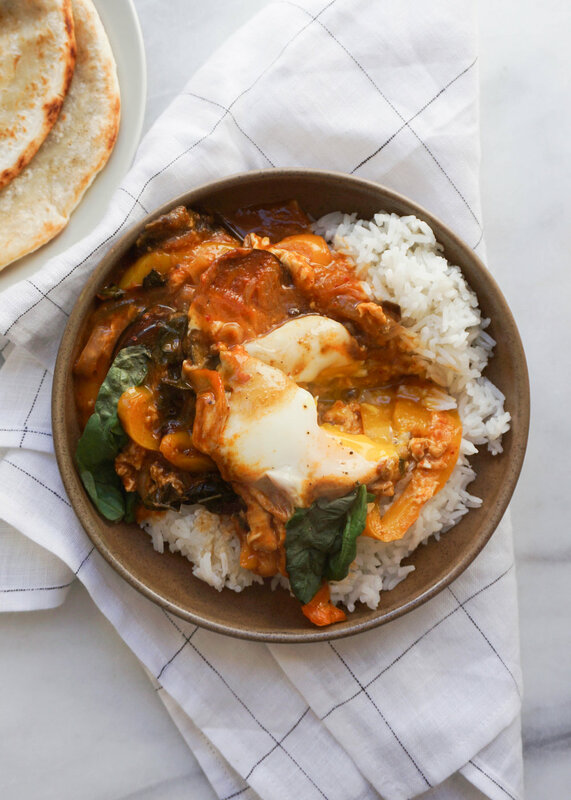 This Red Curry Shakshuka is an awesome dish to make when you're feeling super elderly and just want to lounge around in your soft pants all day. You chop up all your veggies. Cook them in a pan. Dump in your curry paste and coconut. Crack in some eggs and let simmer for a few minutes until your eggs are set. Then you magically have a healthy-ish meal full of vegetables! I thought up this recipe one lazy morning when I work up hungry, needed to eat something substantial, but all we had in the fridge was some leftover thai food and some half dead swiss chard. We had half a plastic tub of delicious red duck curry, but we had already pick out the good bits. No duck, eggplant, or peppers left. Just sauce and some onions and a rouge pineapple chunk. Eat the pineapple chunk out of the container, throw in some greens and some eggs, and you got yourself a brand new dish!! Red Curry Shakshuka was born! 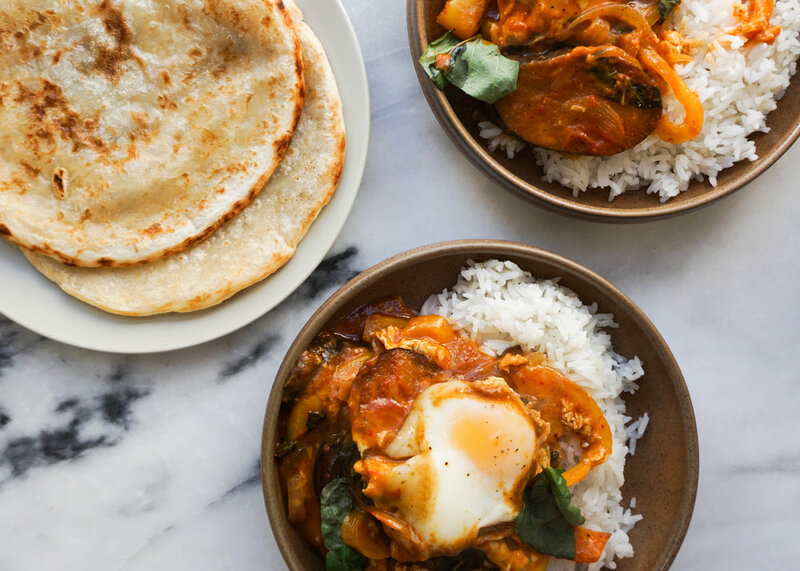 You can follow this recipe to make your own curry or you could also go the leftover Thai food route if you're looking to not waste leftovers. Either way, it's going to be so wonderful and cozy. 1. Let's prepare our veggies. Peel and chop your onion into crescent slices. De-stem and seed your bell peppers and cut into slices. Cut the eggplant into 1/4" slices. 2. Heat oil in a skillet over medium high heat. Add onions, season with a pinch of salt and pepper, and allow to cook for 3 minutes. Add bell peppers and eggplant, season again with a pinch of salt and pepper. Add red curry paste and with a wooden spoon or spatula, mix into the veggies until evenly incorporated. Cook all the veggies for 5 minutes. The paste should be inherently spicy, so you don't need to add any extra heat. 3. Add coconut milk and brown sugar into the skillet and bring everything to a simmer. Add spinach a handful at a time and the thai basil and mix into the skillet until wilted. 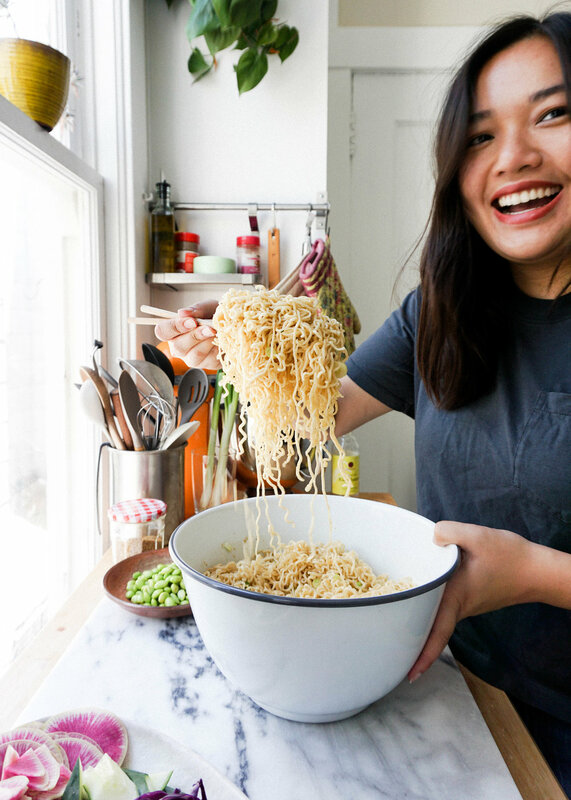 Give it a taste and add more salt, pepper, or brown sugar if you feel like you need it. 4. Make little wells in the curry with the back of a spoon or bowl and carefully crack your eggs one at a time into the curry. Simmer the curry with the eggs until the eggs have set, about 15-20 minutes. 5. Remove the skillet from heat and allow to cool. Garnish with some thai basil leaves and serve up the curry with some rice or roti. Some crusty bread would be great too!